Alright it's a hot mess while it's under construction. But Eric thought maybe some others would enjoy the pics. Here's what I'm working on. I gathered up a bunch of trashed windows (with permission) from the dumpster of a window replacement business. They were happy to give them away for free! I built the frame of the greenhouse and I am now trying to cover it with all of these windows. I also got a french door on the front...should have gotten a pic of that. The door was in the dumpster as well. I'm going to have to go back and do some caulking and stuff but I think it'll work well when done. Looks like a place you will enjoy when finished! Mine is only 12x16' and it faces south. Rather than an "A" type roof, I have one that slopes from north to south. The north wall is sheeting with R-26 insulation, then covered with Mylar. I also insulated along the front (about bottom two feet) and part of the sides. It made it much easier to heat last winter. OK, this is what I wanted to do!!!!!!!!!!!!! I had no idea where I would find windows though! man. Now I want to do this even more!!! seriously, went to a window replacement business and walked inside and asked if I could grab some out of their dumpster, they had absolutely no problem with me getting them. Thanks for posting the picture. If we talk more and more about greenhouses, Roger will consider a Greenhouse forum. Also, Mike has the style greenhouse I was talking about in the PM. hmmmmmmmmmmmmm..... maybe I can find out where there is a window replacement place! Please post more pics when it's completed. I do have a question: on the roof, with the windows, how are you doing to deal with rain water ponding at the bottom of each piece of glass? Just some thoughts: Silicone sealing will work to protect the wood, but it will not prevent some ponding. As it dries, pollutants in the air will mix in and you may have a problem after a year or two, maybe sooner. Actually, I'd have to say that this one looks like an excellent example of a....glasshouse...glasshouse...glasshouse! I'll have to agree with Mike on the roof windows. I personally would go back and dumpster dive some sliding glass doors. I separated the glass for my greenhouse roof, but now I wish I had not. Great start!!! I will be doing the same thing in spring, so far I've collected 35 windows. 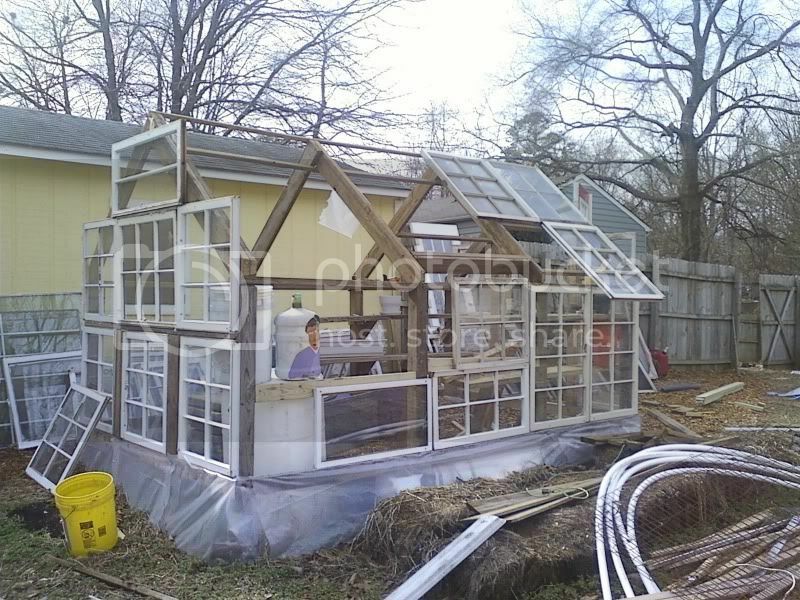 We really need a forum for season extenders like greenhouses, coldframes, and hoophouses. That is going to be a nice green house. I like how you designed the frame so the windows hang over and nothing needs to be cut to fit. I ran an ad on craigslist looking for free windows and got replacement windows from a house. I am planning to do the exact same thing your doing built a pressure treated wood frame then attach the windows. I do not have a door yet. I will also need 2 loover vents, fan, and thermostate. I may do what you did and get lucky and find a french door too. I can probably build a door using 2 windows. as far as designing the frame so that the windows hung over and nothing needed to be cut...that was luck and guess and check with the different windows. I originally had it covered with plastic, but the plastic couldn't stand up to the summer sun and I'm not messing with that every year. But the windows are all different sizes so I am kinda fitting as I go along.